» What Is The Best Litter Scoop For Cat Litter Boxes? 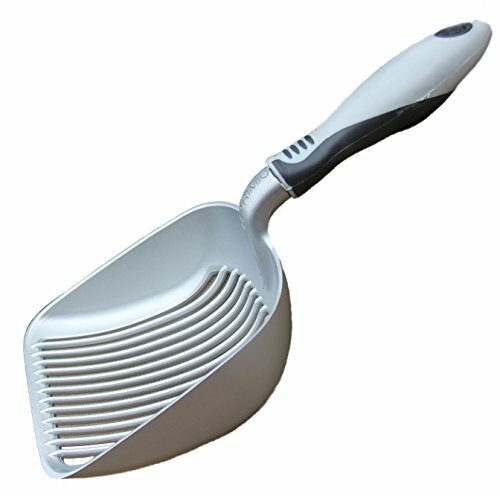 ​If you have a cat litter box you will definitely need a cat litter scoop. Generally speaking they are inexpensive however you still need the best tool for the job. Litter scoops fall into two categories. Which Long Handled Scoop Do We Recommend? Which Litter Scoop Is The Best? 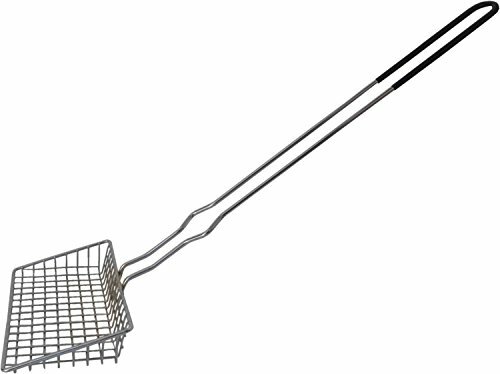 A long handled litter scoop is useful people who have back problems, are recovering from an operation or have other issues that make bending difficult. A scoop with a long handle makes scooping the litter box so much easier when there is no bending required. Cleaning the cat litter box​ is not a chore that we really want to ask other people to do for us, so a long handled scoop can be a lifesaver​ and allow you to continue doing a job without asking for help from others. Regular size handle scoops are what we commonly think of when we think of cat litter scoops. Price - The budget is a factor. How much do you want to spend on a scoop? They are inexpensive anyway but you may have to pay a few dollars more to get the features you want. Material - Most scoops are plastic, some are wire and some are steel. There’s nothing wrong with plastic as long as it is sturdy and not going to bend. Length of the handle - As mentioned above, a long handled scoop will be a boon for those with back problems and even without a back problem just getting older means it is more difficult to crouch down to scoop litter. This is a good option for those who want it. Holder - Yes! I love the idea of having somewhere to actually put the scoop. It’s just one less thing to think about because it will always be in the same place. Shape of the scoop - The shape of the scoop is important. It needs to be able to get into the corners of the litter box easily so a rounded scoop may make that job a more difficult. Sturdiness of product - This goes without saying. This is a product you will be using daily so it needs to be sturdy and not flimsy. Even though it may be inexpensive it still needs to do the job. The handle is extra long (16") which means less leaning over to scoop. It is well priced and it's a very fast job to cycle through the litter with just six or so scoops. The scoop is deep ​so it can handle a lot of litter at once. The best way to use is as follows; scoop and then when raising the scoop, shake gently from side to side so that the larger pieces of litter (depending on what you are using) can pass through back into the litter. Dust is minimized by not lifting the scoop too high. This scoop is plastic. The handle is molded and easy to grip. It is 19”inches long in total and is plastic. The long handle makes it easy to reach into the back of the litter box and less of a back breaking chore. It is sturdy and the generous extra large scoop means it does the job quickly. Have a good look at the scoop though because the openings may be too large for some types of litter. On the flip side, this does allow clean litter to pass back into the box. This is a tough workhorse of kitty litter scoops and is a real boon for those with mobility issues. The handle is extra long, 18” from the basket to the tip of the handle. The scoop is a heavy wire gauge, it will stand the test of time. The handle is vinyl coated for comfort. It is suitable for use with pine pellet cat litter as the pellets will fall through the openings which are ⅜ x ⅜” in size. The shape of the scoop means that it is easy to get into corners, something that a rounded scoop cannot do so easily. ​This scoop is 30" long so really ticks the boxes for not needing to bend to scoop the kitty litter. It is a strong and lightweight ​scoop and does the job well. Because the handle is so long, it can be used with two hands which is an important consideration. This scoop is American made. Long handled scoops are not used in the same way as shorter handled scoops. That is because the force exerted with scooping is going to be different (most of the time). Think of the action when using a dustpan and brush. A shorter handled brush allows us to brush debris quite vigorously however a dustpan and brush with a long handle (upright variety) needs a more considered approach and is not done in a hurry. The same principle applies to the long handled litter scoop, it will require a slower approach. Mostly this would not be a problem as people with mobility/bending problems are not going to want to scoop at 100 miles an hour. A shorter handle allows for more vigorous scooping. Almost any product will break if not used in the manner it was intended. Keep this in mind when considering your options. If mobility issues are the foremost concern then definitely the No Stoop Litter Scoop or The heavy duty scoop made by Imperial Cat. Both have very long handles, can be used with two hands if necessary. 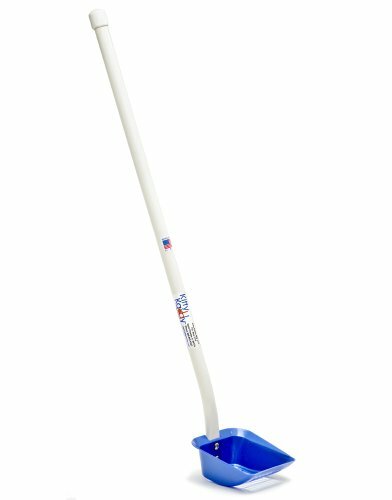 If you still require a long scoop but not something that is necessarily for mobility issues the Petmate Ultimate Litter Scoop (19“) or the ﻿Pureness ﻿Long Handled Litter scoop (16”) will both give the benefit of using a longer handled litter scoop. There a lot of litter scoops​ and no doubt you have tried some and have ​some idea of what you ​want. Primio have designed this scoop taking into account all of the concerns people had with other scoops. It is Teflon coated, so makes cleaning sticky messes much easier. 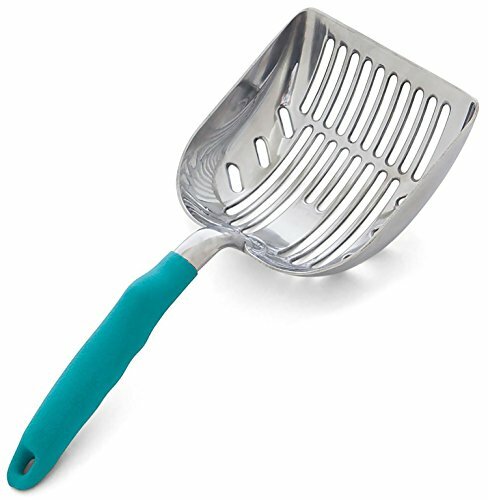 It has a deep scoop but is not so large that it can’t get into corners. The design of the spacing on the scoop is particularly important and this scoop only lets clean litter through. It is made from aluminium (with the Teflon coating) and comes with a wall holder. The handle has an ergonomic grip so it is easy to hold and has a lifetime warranty. They really do have all bases covered with this scoop. The caddy and the scoop are made from plastic. The caddy is a huge draw card as the scoop can conveniently be kept tucked out of sight or wherever is convenient which makes the whole business more hygienic. A scoop alone is tricky to store. The scoop also has a hole at the top of the handle for hanging. Note the entire caddy and scoop do not hang together, it just an option for the scoop. It’s non stick which is a bonus which helps with cleaning and it has an has an anti microbial coating. This scoop is cast aluminium so the handle won’t separate from the scoop. 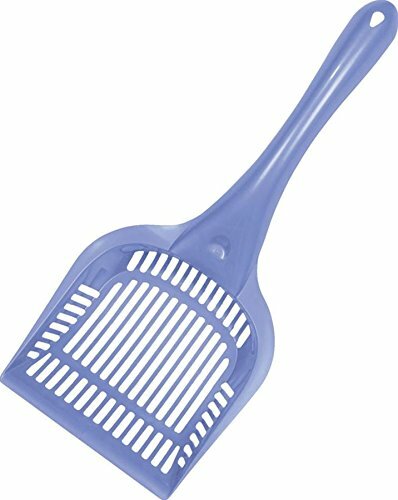 It’s a big scoop and it’s tough enough to able to pick up large clumps without bending. The handle is comfortable and easy to grip. This is a tough scoop that gets the job done and lasts for years. It is refreshing to hear that this lasts for years. If it makes the job easier and it’s going to last for years, it’s going to get a big thumbs up. The three scoops we have chosen from many are the cream of the crop. There are any number of cheap plastic scoops but they warp and just don’t last. Our first choice is the IPrimio scoop for the design qualities and that it ticks all the boxes in what consumers want in a scoop, plus it has the wall holder. 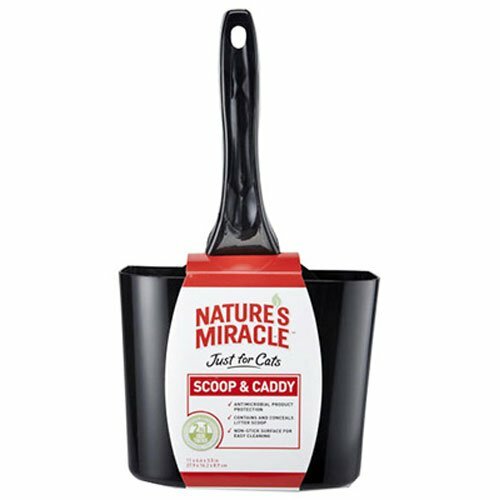 Natures Scoop with the caddy is a big drawcard ​in the neat and tidy department. The DuraScoop gets top marks for toughness, reliability, price, ease of use and for being long lasting. 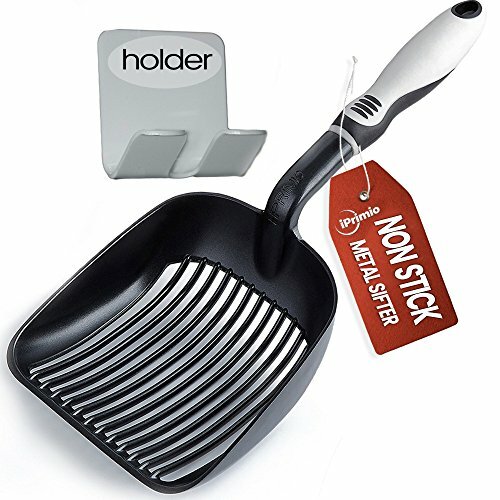 ​A litter scoop helps to make the job of cleaning the litter box easier and more hygienic. ​Although regular scooping is definitely a big plus in keeping the litter box clean, there are other steps you can take to make sure the litter box is always in tip top shape. ​How to look after a litter box. Everything you need to know. Previous Post How To Decide Which Is The Best Cat Litter Mat Next Post Is There A Best Litter For Declawed Cats?